I don’t look like it, but I am already an oldie. While I’d like to believe that I am a toughie, I get all kilig when people mistake me for a recent college grad or at best, someone in my early 20s. Thing is, I don’t want to grow old myself and wished I could have stopped time when I was 25 years old but life doesn’t work that way. Hence, I am a little OC when it comes to skin care. In fact, I am not even a fan of skin procedures and has yet to experience a facial. I don’t like complicated procedures done on my face hence I have stayed away from any kind of treatment which may be done in my face. When I was younger, my only skin care regimen is washing my face in the morning and before I sleep and I wasn’t even doing that religiously. Sometimes I fall asleep in make-up after a heavy day at work – this is not recommended and will wreck havoc on your skin. Lately, I have started to build my own skin care routine based on the things I think in need. 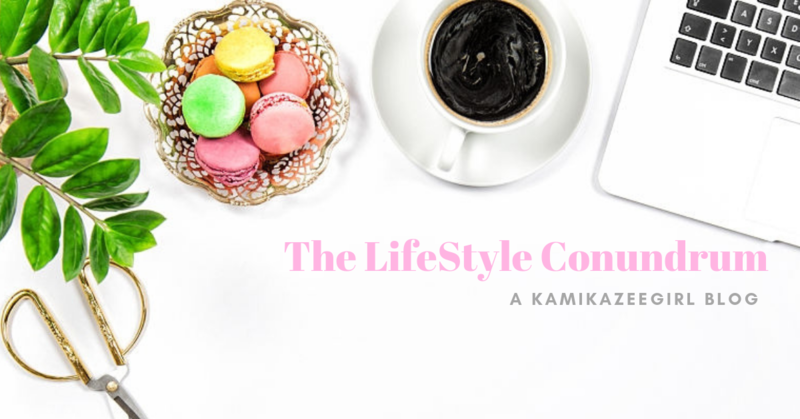 I did not consider only one particular brand and instead picked items here and there from various lines, basically whatever works best for me. I mixed up local brands and newbie players in the market and didn’t event considered price points. Bottom line is, I always believed that it’s a wonder to find skin care products that works best for you. So when you do find it, stick to it and your skin will thank you. I discovered Innisfree’s line of facial wash and cleansers on my last trip to Seoul almost a year ago. One of my best discoveries is their Jeju Volcanic Pore Cleansing Foam and its Scrub variant, both of which I have been using religiously since then. I am now on my third tube, which was bought for me by a colleague in Shanghai during her vacation there. For now, I have been getting my fix for this particular cleanser from out of the country since I can’t find an InnisFree branch near me here in Makati. The best thing about this particular cleanser is how it cleanses the face. A pea-sized cleanser can go a long way and cleanses the face really well. After every use, my face feels cleans and smooth and without the oily residue one feels after a day with gunk on your face. It is economical too, a tube can last me six months. I am now down to my last tube and hopefully, I can pick a new supply when I visit Taipei next week. 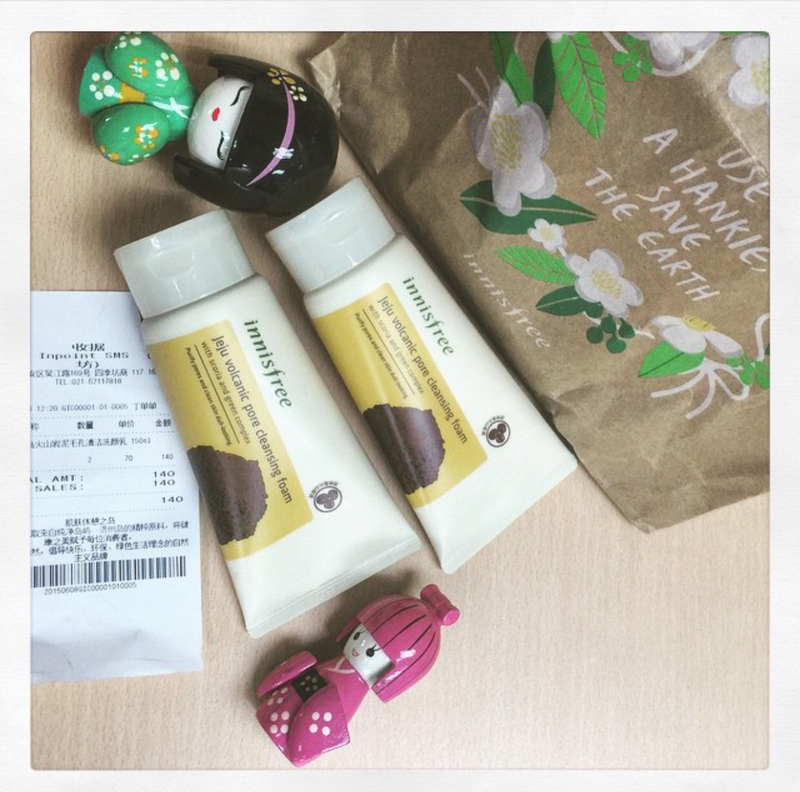 Innisfree’s Jeju Volcanic Cleansing Foam retails for 70 Chinese Yuan or PHP517 pesos each. I only swore by two brands of facial cream and emulsion: The Face Shop and Avon. 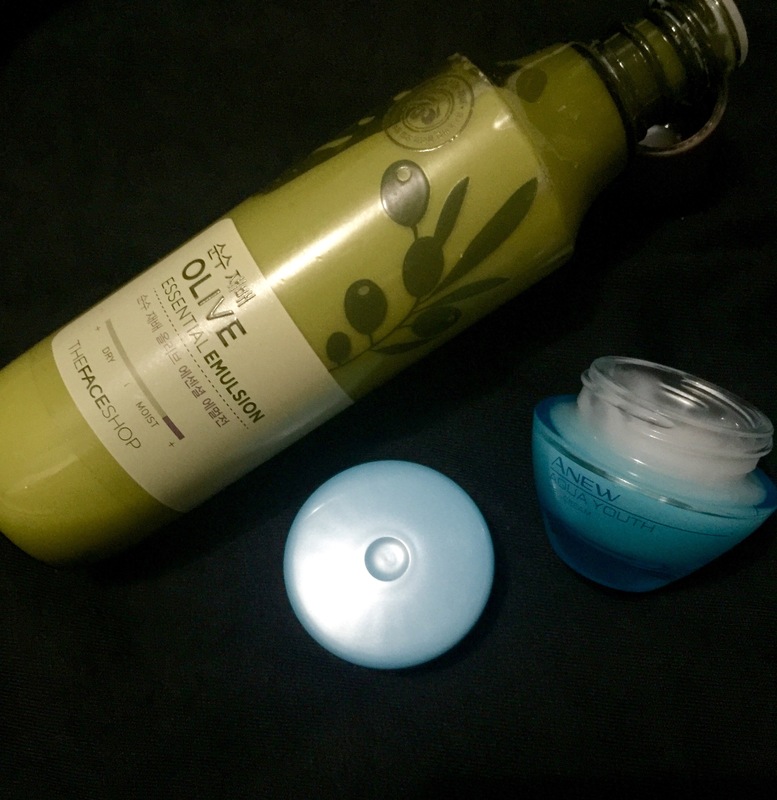 My morning routine is after the facial wash, I will put on my The Face Shop Olive Essential Emulsion before my make-up. This non-sticky lotion keeps my skin moisturized and hydrated, and feeling smooth and softer after every application. I love that this facial lotion doesn’t feel too heavy on my face and that I feel my skin breathe even with the make up on. This is a gift from my brother and his wife, but I believe this retails for about PHP595 in your local The Face Shop branches. My first make-up when I was in college was a simple face powder from Avon, and it’s a brand that I grew up with. Even with limitless brands within my reach, I have never forgotten to order Avon from any colleague who sells its products part-time. For me, Avon is like the sweet, glamorous auntie you can count on for make-up advice. Recently, I am crazy with Avon’s Anew Anti-Aging Line. I am currently using Anew Aqua Youth Gel Cream as my night cream. What I love about this product is that it spreads smoothly and easily, without being greasy or heavy on the face. If you haven’t noticed, I have a thing against greasy products. The Anew Aqua Youth Gel Cream helps me keep my skin moisturized and smooth. After application each night on my face and my neck, I wake up to a supple, softer and smoother skin the next morning. It’s a good routine which I am happy to share with my future daughter. Buy Anew Aqua Youth Gel Cream for PHP399 in any of your trusted Avon ladies. I recently wrote about how I love Facial Masks and considers them my guilty pleasure. I recently discovered the brands Beauty Buffet and Skin Recovery at Watsons and was able to use it last week. 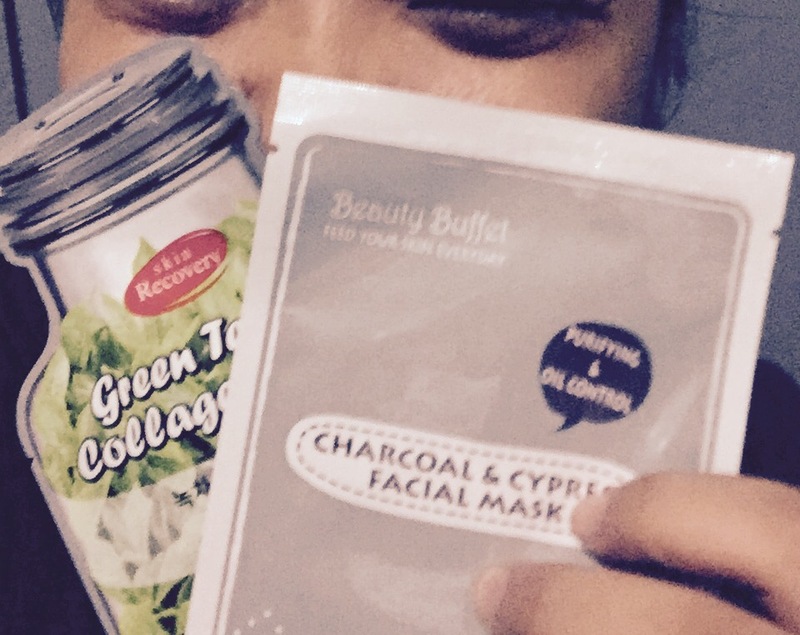 Between two, I love Skin Recovery Green Tea and Collagen Mask more because my face felt more refreshed, soft and clean after I have used it. However, I see now harm in continually trying both brands, considering the low price point of Facial Masks. My idea of a great evening actually is having one of these masks plastered on my face while I draw, paint, practice my calligraphy or blog. That’s my very simple idea of relaxation. Whenever I get the chance to do that, I always fall asleep a happy girl. Both sells for less than PHP50 at any Watsons branch near you. This blog was actually the result of a recent consultation with a beauty consultant who mentioned that I have young looking skin. 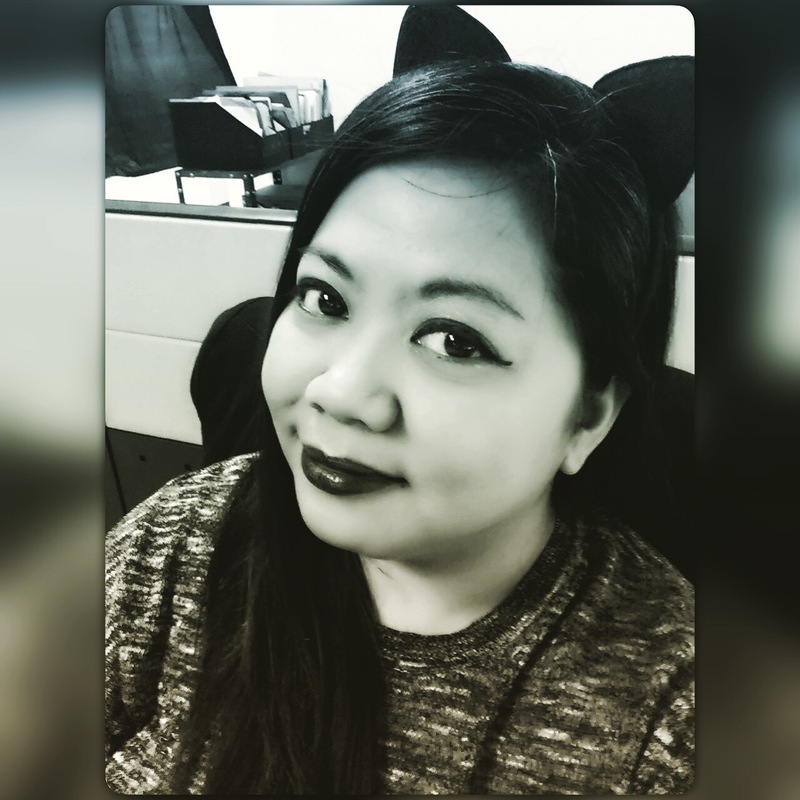 While I am not artista-level beautiful and my weight leaves much to be desired of, one thing I am always proud of is my skin and how young I looked. I never experienced the need for a derma and haven’t done any facial yet so I am glad that this probably means I am taking care of my face well. In my industry where public relations meant constantly meeting and reaching out to people, a beautiful and well-maintained appearance helps a lot. Because I love masks, I am currently trying their Botanical Effects Facial Mask for normal skin and their Mary Kay Oil Matifier. I will definitely give feedback as soon as I have strated using these products. I already tried the mask and was taken aback how snug it felt as soon as I applied it to my face. The mask is in a heavy cream form, which I didn’t like as much. In spite feeling like applying white cement on my face, I must say that my skin felt fresh and smooth after I managed to wash the gunk off my face. Previous PostTeqube offers gadgets based on the Filipinos’ digital lifestyleNext PostHow do you know if you’re ready to invest in a condo?